Martin Luther King Jr. 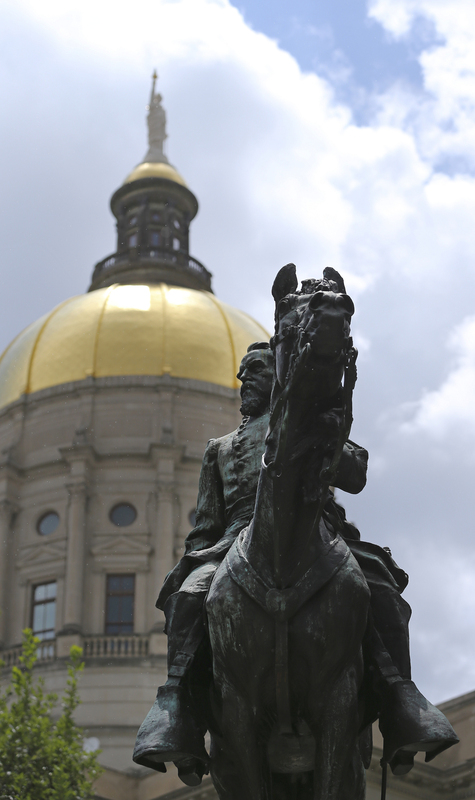 Statue Set To Be Unveiled In Atlanta Near Segregationist Monuments King is the first African-American to be memorialized on the state Capitol grounds, where monuments to Confederate generals and segregationists stand. A statue depicting Confederate Gen. and former Georgia Gov. John Brown Gordon on horseback outside the Georgia Statehouse in Atlanta earlier this month. Gordon was also reputed to be a leader of the Ku Klux Klan. On Monday, 54 years after Martin Luther King Jr. delivered his famous "I have a dream" speech and less than a month after a counterprotester was killed following a demonstration by white supremacists in Charlottesville, Va., a statue of the legendary civil rights leader will be unveiled outside the Georgia State Capitol in King's hometown of Atlanta. The state Capitol grounds are dominated by the figures from Georgia's Confederate and segregationist past, including Confederate general and alleged Ku Klux Klan leader John Brown Gordon and U.S. Sen. Richard Russell, one of the staunchest opponents to the civil rights legislation King advocated for. "The King statue will inspire and give hope to generations to come," said longtime state Rep. Calvin Smyre, a member of the Georgia Legislative Black Caucus who helped raise money for the statue. "The day the statue memorializing [King] is unveiled will be a great day in the history of our state and nation." The date for the unveiling was set well before the recent violence in Charlottesville, but the symbolism of the King statue has increased with moves to take down Confederate monuments across the country. As in a handful of states, Georgia activists and politicians pushing to change street names honoring the Confederacy and remove Confederate monuments are stymied by state laws saying they cannot be "relocated, removed, concealed, obscured, or altered in any fashion." "I think that this will be a symbol that the state of Georgia is in the business of erecting monuments to deserving individuals rather than focusing its attention on taking down monuments of the past," said Georgia Gov. Nathan Deal, a Republican, who will preside over the King statue's unveiling. A Democratic candidate for governor in Georgia has called for giant carvings of Confederate icons Robert E. Lee, Stonewall Jackson and Jefferson Davis to be removed from nearby Stone Mountain, which is sometimes called the Confederate Mount Rushmore. Deal said he opposes that move, which would likely take lots of explosives, but said it's time for the state legislature to discuss changes to state law that might allow for other Confederate monuments to be changed or removed. Over the past three years, Smyre has worked with Deal, the King family and the legislature to plan and raise money for the statue. The project was delayed in 2015, when the original sculptor, Andy Davis, was fatally injured in car accident. A new sculptor, Martin Dawe, was selected last year. King was first recognized at the Georgia State Capitol, when then-Gov. Jimmy Carter had a portrait of King installed on a wall near images of previous governors. The statue of King will sit on the corner of the Georgia's Capitol grounds, looking northeast in the direction of his boyhood home, Ebenezer Baptist Church where he and his father served as pastors, and his burial site. The statue will be easily visible to drivers on the nearby Martin Luther King Jr. Avenue. The statue of John Brown Gordon, who was also a former senator and governor, sits on the northwestern side of the Capitol grounds across from where the King statue will be installed. The Georgia Capitol building sits in between them. "What [King] had to overcome had been established by John Brown Gordon," said Georgia State University professor Tim Crimmins. "They're on opposite sides of the north side of the building, but they represent suppression on the one hand, and the ability, the will to overcome it and the success of it with Martin Luther King Jr."